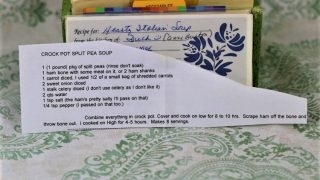 Front of the recipe card for Crock Pot Split Pea Soup. 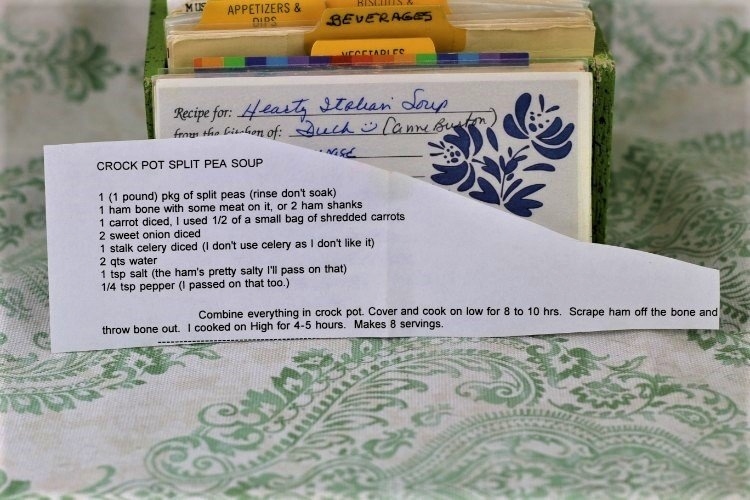 There are lots of fun recipes to read in the box this recipe for Crock Pot Split Pea Soup was with. Use the links below to view other recipes similar to this Crock Pot Split Pea Soup recipe. If you make this Crock Pot Split Pea Soup recipe, please share your photos and comments below! Combine everything in crock pot. Cover and cook on low for 8 to 10 hrs. Scrape ham off the bone and throw the bone out. I cooked on High for 4-5 hours. Makes 8 servings.